During Sprachman’s career, the large 2,000-plus–seat theatre had become an anachronism for moviegoing purposes. Television began to erode motion picture revenues. Then came cable TV, pay TV, and, finally, the video revolution. As a theatre architect working in an era of cutbacks and scaled- back economies, Sprachman increasingly engaged in designing multi-screen venues, by creating new ones, such as in shopping centres, or by creating them through converting older, larger theatres. A pivotal point in this occurred with the conversion of two Thomas W. Lamb theatres in downtown Toronto, the Uptown Theatre (1920) at Yonge and Bloor and the Imperial Theatre (1919) at Yonge and Dundas. These were converted to five and six-screen venues respectively, in 1970 and 1972, two of the world’s first multiplexes. In renovating the Uptown Theatre, Sprachman converted the old balcony level into an auditorium, retaining the original, sloped balcony seating, making it one of the earliest instances of the “stadium seating” so common today. This particular theatre became a favoured venue for the Toronto International Film Festival. As the economies of moviegoing continued to shift and change, both of these early “multiplexes” outlived their owner’s requirements. 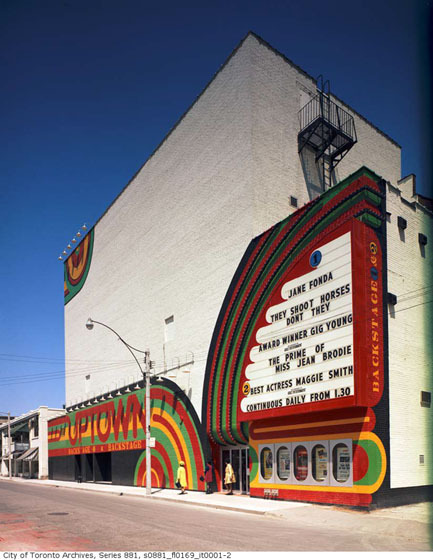 The imperial Theatre was restored as a single-auditorium live theatre venue, now the Ed Mirvish Theatre. The Uptown Theatre was sold to developers in 2003 and demolished the same year.